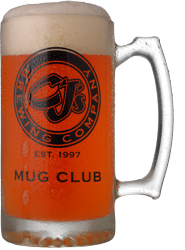 Join CJ’s Mug Club and become a VIP! Stop by CJ’s Plymouth to join today! Want to take some great beer home? CJ’s offers Growlers, in gift sets with pint glasses or by themselves, and we’ll refill them with any of our great drafts for only $9.00.